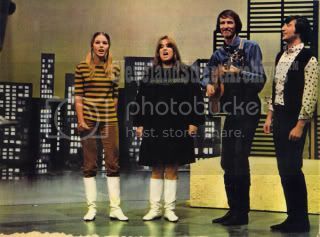 Someone sent this to me - the group on American Bandstand in 1966.
it's funny that u posted that pic because I had a question re: AM that I thought u guys could answer. Other then the supposed "12:30" episode, did the group appear any other time on AM other than the episode that is pictured? Funny that the show was in b/w and the picture is in color. me again. Got an email yesterday that CD Universe has shipped the dvd. Alby, thanks for posting the back cover of the DVD but I can't make out what it says, though at this point in life I'm part bat! Many times color photos were taken at the TV shows for archive purposes or even for teen magazines, though the show was in b&w. I've seen some GREAT color photos of the Byrds on Shindig, too. It's also cool to see color photos of Hullabaloo since just about every show that survives now is b&w kinescopes, with 3 exceptions. As for the M&P on Bandstand, I have them listed as being on the 2/19/66 show (Cal. Dreaming) and 8/12/67 (12:30) only. I watched the dvd bonus material and it consists of extended interviews with Michelle, Denny and John. No clips or other pictures. Pretty cool seeing the interviews though. Thanks for the information. It'll be interesting to see the extended interviews. Perhaps the reason they put in etended information about John Phillips' problems with addiction is because the documentary concentrated on him. Here's a review of Straight Shooter.